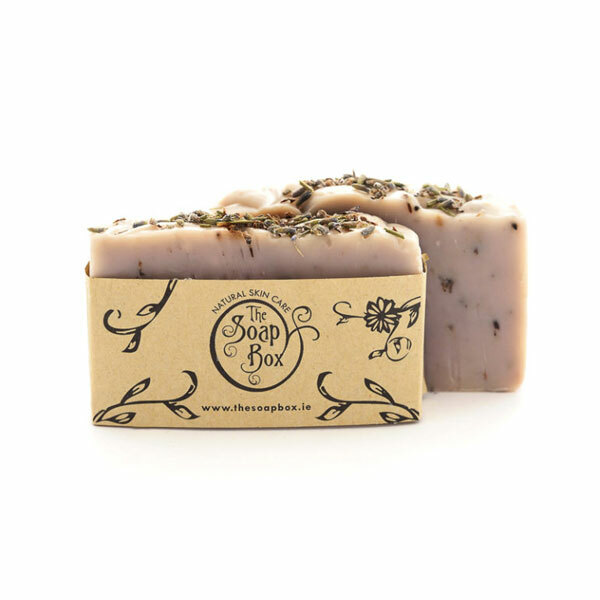 For all you folks out there who adore lavender, our Lavender soap has an intense scent of therapeutic-grade Lavender Essential Oil. This luxurious soap is also packed full of lavender buds which gently exfoliate and massage the skin. Lavender Essential Oil is well known for its calming, relaxing and balancing effects on the body. Lavender has antibacterial properities and can be used to sooth skin irritations especially acne and itching associated with eczema and other dry skin conditions. Lavender is used in skincare for its antibacterial, anti inflammatory, antiseptic, skin soothing and mood lifting properties. Your skin is in for a treat with the Soapbox’s ALL NATURAL range of handmade cold process soaps. This method of soapmaking ensures that the soap retains it’s natural glycerine which is excellent for dry skin. A blend of olive, coconut and castor oil is used which results in a glycerine rich bar with a rich luscious long lasting lather. Beeswax is added for hardness. The scents in this range are from a blend of high quality pure essential oils, each with their own therapeutic properties. Each variety has it’s own natural exfoliant in the form of flower buds and seeds, citrus rind, wholegrains and seaweeds. The colour is obtained from plant roots and seeds. Talk about spoiling your skin! We hope you enjoy using our soaps as much as we enjoy making them. Sodium Olivate (olive oil), Sodium Cocoate (coconut oil), Aqua, Sodium Castorate (castor oil), Cera Alba, (beeswax), Lavandula Augustifolia (lavender essential oil and buds), Alkanna Tinctoria (alkanet root), All naturally occuring in essential oils: linalool, geraniol, limonene.